A roulette computer is a discrete electronic device that is used to predict roulette spins. Indeed millions have been won with such technology. Contrary to popular belief, roulette computer use is actually legal in approximately half of the world’s casinos. That doesn’t mean application is welcomed by the casinos though, so they are used covertly with the devices being worn under the clothes or even in the operator’s shoe. Over the years I have accumulated numerous other roulette computers including Forester’s FFA & FFZ, and Mark Howe’s computers. I can honestly say my technology’s effectiveness and practicality far exceeds that of competing devices. But of course you’d expect me to say that about my own technology, so how do you know the truth about my device? Do research thoroughly. And I don’t mean merely do a few Google searches, because that will only give you a flood of absolute rubbish published from people who have ulterior motives, most of which is published under fake names on various forums and web sites. Also see genuine winner roulette system for details on how far some people go trying to discredit me. Another one of my roulette computers is detailed at hybridroulettecomputer.com – it is the only roulette computer technology available anywhere that is capable of predicting spins automatically without the operator needing to even look at the wheel. 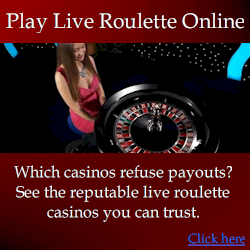 My technology has generated an enormous amount of controversy and envy from other roulette computer developers, which has resulted in an incredibly desperate array of lies about me. But thorough research reveals fact from fiction. 1. 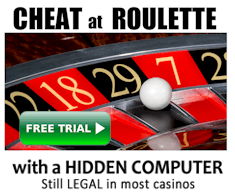 The truth about the basic algorithm 99% of roulette computers use: this is explained in my roulette computer algorithm page. My computer is capable of using this basic algorithm, but also has alternate and far more advanced algorithms that are the difference between no accuracy, and incredibly high accuracy on modern wheels. So you know at the very least it is capable of equalling the accuracy of an average roulette computer. 2. What makes my roulette computers better: see full details about what makes a roulette computer effective or not (how to build a computer), then see the roulette computer comparisons page so you understand the critical differences between roulette computers. Carefully review all information, then ask each seller the right questions. Expect they will lie to you, but ask the right questions and you will find a liar will either contradict themselves, find an excuse to avoid answering, or give you an answer that doesn’t make sense. Learn more about my roulette computers.